What wonderful descriptive words. I love this quote just because of the use of the descriptive words, like poetry. 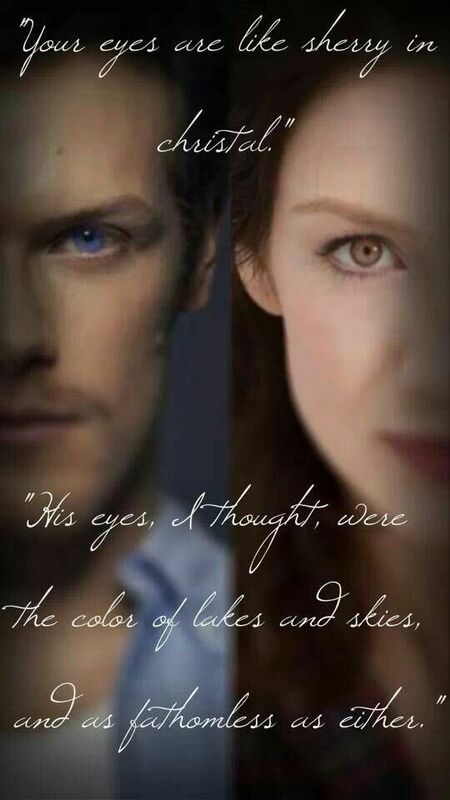 Granted, I chose to use all Outlander quotes in this challenge this time round, but why not! Did you see tonight’s episode? I tried my best to watch it, but it was difficult thanks to my daughter and her boisterous boyfriend who came inside to chat with me as the new episode started. Outlander it really the only television that I watch. I just can’t be bothered watching much on television anymore. I was never a big TV watcher so it’s not a giant leap into silence. I just prefer the quiet these days. I like to look out my window and watch the kids play on the rope swing. I imagine what they may be saying when I can’t actually hear them. I enjoy reading, but haven’t the patience or the wakefulness to read presently thanks to my surgery. Maybe this new week will find me reading a new book my best friend gave me. Most of all, I love writing. I haven’t been able to do that very much thanks to the medications post surgery, but I’m weaning myself off those darn things already. I hate them. And now to nominate my last 3 people for this 3 quotes 3 days challenge. It sure doesn’t have to be as wordy as mine. You can simply pick a quote and pick your 3 people for the day. I just happen to be the word monger so, well, you know how I am if you visit here enough. I hope you have enjoyed my quotes. I know it’s taken me a week to get the challenge completed, but I think I get a pass this time. I was a little busy with surgery this week. https://trulyunplugged.com/ because we are kindred spirits! https://letthelightinreflections.wordpress.com/ because if I know anyone who can find awesome quotes from the best book, it’s you! https://wallpaper-tadka.com/ because you can use beautiful quotes with those gorgeous flowers that make me so happy! I’m finally home from the hospital and freed from all the annoying tubes and wires. This means it’s blogging time! I’ve missed blogging so much. It also means, I can get back to my second day of quotes, more importantly, Outlander quotes. I said regarding the first quote how deeply Claire and Jamie loved each other. If this quote from Jamie doesn’t seal that idea into your head, I don’t know what will. I don’t want you to think that this series is just some sloppy love story though. It is anything but what you would expect My husband has laughed when I’ve read pieces from these books because Diana Gabaldon is the wittiest and most imaginative author I have ever had the grace to read. If you haven’t already, I absolutely suggest reading her work or at least watching the series on Starz. It is also done very well. Now, for today’s nominees… duh, duh, duuuuh! https://monicavel.wordpress.com/ a wonderful motivational blogger with great advice! https://winewankers.com/ The best wine blog ever! Man, I’m looking forward to a good glass when I’m no longer on my pain meds! That’s it for today’s quote. Check back again tomorrow for another Ourlander quote and 3 more nominees. If you choose to play along that’s great! We’d love to have you long for the fun. If you choose not to, just let me know. I won’t be offended. I’ve been nominated for the I SING THE BODY ELECTRIC challenge today by the one and only lizalizaskysaregrey. I’d like to thank her most profusely and hope that I am up to the challenge as I love quotes, but I’m off to surgery in the morning. I will try to post my quote for tomorrow before they wheel me off! Hopefully I won’t be too out of sorts on Saturday to post as well. Thank you Liza so very much for thinking of me. I’ve selected a quote from my favorite series and nominated some great bloggers to participate in this cool idea! Keep this rolling. It will grow and It will expose us all to more of each other’s blog posts as well. Let’s grow together! Two of my favorite literary characters are Jamie and Claire Fraser. Their love is a true and pure love, although it didn’t start out that way. I won’t spoil anything by reviewing this series, which is by and large my absolutely favorite, because I would simply give away too many spoilers. I have read and reread the entire series so many times. I watch the series on Starz as well and I will tell you that it is excellently cast and so well done. I chose this quote to be my first quote of my 3 day challenge of quotes because it epitomizes the truest of loves. I feel this for my husband. Well, when I’m not being a terribly wretched human who is ungrateful for the wonderful things he does for me. Yes, I have so acted this way towards him. I hate when I do that, too! I love him with my whole heart. I wouldn’t be the person I am without him. When you hear the cheesy phrase, “he completes me”, they are referring to my Hubs and I. No, seriously. We keep each other in check. It doesn’t mean we always get along. In fact, quite the contrary. We often do disagree and I am the over-the-top extrovert, whereas he is the quiet introvert. Somehow, we complete each other to make one whole person that makes sense. We bounce ideas off each other and when I’m upset, and I’m often upset, he always, somehow magically, makes me feel better. A great quote which also works for anxiety! Ah, I can smell the roses today. Well, figuratively anyway. My roses are not in bloom yet, as it is mid spring in my part of the world. I’ve have a wonderful day today at my first day of my new job. I was very anxious this morning as I set off to work. You know the heart racing, nearly in tears kind of anxiety. I am here to say, I’ve made it through and it turned out to be a good day. In fact, I’m glad I’m there. I will miss many things about my old job for sure, but I believe I made the right choice. At least today, I think I did. I will miss many things about my old job. I will miss my friends dearly. Over the last 10 years, I’ve made some wonderful friends. I will miss my patients and the actual job itself, but I will not miss the hours. The hours I spent working at my old job were getting ridiculous, granted, the paychecks were great and I will miss those very much. I had to make a choice though of what was most important, money or time with my family. I chose family. I know I need to work to support my family. I know that in these hectic, expensive times, it’s very rare that a family can manage on just one income which is why I work. If my husband made enough, I would stay home. As it is, we will be making more sacrifices due to my pay cut, but my time with my family is worth that as is my mental health. I am cutting down my hours as well as changing jobs, although I’m still a registered nurse. I have been a home health nurse for many years. I’ve cared for a great number of people in my time of all ages, but mostly I’ve cared for children. Now, I’ll be working for a clinic in a float position in surgery, speciality and cardiology departments. I’m looking forward to these new challenges and I know I can do it, but it’s scary to me. It is something that brings out my anxiety. The good thing is I know how to accept that I have anxiety and I know how to deal with it. Several months ago, I had a very difficult time doing that, but now, I’m stronger and much better able to handle this wicked monster. I will prevail and anxiety will not win. I’m stronger than it is. It’s good to be different and not to just fit into the same mold as everyone else. I’m talking about that one little thing that makes you uniquely you. We all have it. Sometimes we don’t always know what it is and need to take the time to examine ourselves to figure out what it is. My quote on Day 2 of my 3 Quotes in 3 Days is from Coco Chanel. She was an incredible lady who made a name for herself. When she said “In order to be irreplaceable, one must always be different”, she was absolutely right. What is it about your best friend that makes her your best friend? What about your spouse? I can only speak for myself but I can tell you that my best friends are completely irreplaceable as is my Hubs. These people are each very unique and amazing in their own individual ways. My Hubs has this mostly calm demeanor when it comes to me. He understands what I need most of the time, although it hasn’t always been that way. He has come a long way from the beginning of our marriage, or for that matter from the beginning of our relationship many years ago. The one thing that has always remained true is his undying devotion and love for me. That has never faltered. We both have our own issues, but in accepting each other as we are, we have learned to grow our love instead of let it grow stagnant and cold. He is my everything. Without him in my world, I could not exist any more. He is more than my other half. He knows how to deal with my emotional drama and upsets. He knows how to just hug me and hold me when I’m worried or upset. He doesn’t yell at me although he may become frustrated at times, he forgives my transgressions easily. He is irreplaceable because of these things and so much more. He is my only love, my only true love, my world. My best friends are much the same as they each know what to say when I’m upset when I’m down or what to do to make me happy when things are not going well. They truly show me how much they love me just about everyday. We always keep in touch, no matter the distance or the time in between. That’s what makes our relationships special. They are different but in the same sense that I’m different. It’s our differences that make us irreplaceable, exactly what Coco Chanel was talking about. In job interviews, the employers are also looking for something that makes you uniquely you, so in other words, different that the other candidates. Don’t be too different, just be who you are. It’s always fun to have something that makes you stand out from the others. For instance, I’m starting a new job tomorrow. I bet there were not other candidates who blog and write poetry on a daily basis for this job. I’m a registered nurse by trade. I am married with 4 beautiful children. I’ve been a nurse for 20 years, but have been in the field of nursing for 29 years. I’m a pianist, I can play flute and guitar (not well on the latter) and I can sing fairly well. I love to paint and refinish furniture. I work hard and I like to play hard when I get to play. I love to travel with my family and especially spending time with my family in Naples, Florida. I’d rather have seafood or fish than meat. I love a good meal out and a good home cooked meal equally. These are the things that make me uniquely me. They make me different than others. So, if you haven’t figured out what makes you uniquely you, and different from others, think about it. You are different and irreplaceable. Just think about it. I dare you! I have been thinking about all the blessings I’ve been given in my life and I have to tell you, I’ve been truly blessed. I was adopted when I was 5 days old by the 2 greatest parents a girl could ever ask for. I don’t have much information about my birth parents and many people might think that to be strange in this society. To me, I’ve always been an optimist. My glass is more than half full. It’s overflowing with the kindness of my parents and my family and friends. I don’t expect things out of them. I work hard to raise my kids. I work hard at having a good marriage. I realize I am a difficult person to live with, but I’m blessed by those I’m surrounded by. What more could a girl ask for? When I saw this quote from Oprah Winfrey, I knew immediately that this was the first quote I would use for my 3 quote challenge. I love Oprah. She is a woman who came from nothing and made so much for herself. She worked incredibly hard and had such determination through such otherwise insurmountable obstacles throughout her life. I can’t even imagine how she was able to always keep such an optimist and beautiful view of life, but she did. She has also always been such a generous person, helping those who really needed help, just like Ellen DeGeneres does, as well. I just admire both of them so much with each of the struggles they have faced, they have done it with dignity, something that so many people seem to lack these days. I always try to keep my optimistic view of life and never forget the blessings I have in my life. I may not have everything I would like to have, but I have everything I need. I have a home to live in and keep my family safe, a car to get around and be hockey mom in, a new job that I will be starting on Monday, which I’m really excited about, food to feed my family, a family that loves me and a husband that I adore. What more could I ever possibly need? Of course, I could use more money, a more updated house, a cleaner house, a smaller waistline and extra time in my day, but really those are just desires, not things that are necessary to make me happy. I can’t say that this is the way I always have seen the world. I used to think I needed a bigger house and the small waistline to make my life really happy, but I’ve been on a journey, of sorts. It’s been something that I think many people go through. I can’t say I’ve ever really been a materialistic person. My mom always commented on that. The thing is, I was like most people in that I thought I needed more money to be happier. I discovered somewhere along the way that it was more time spent with my family that was the most important. My husband always says that when you are lying on your death bed, you aren’t going to say, “Gee, I wish I’d spent more time at the office”. He’s absolutely right. What is it that you really want in life? For me, it is to be more grateful of the time I have with my kids and my husband. I think of how my children are growing up and in no time they will be all out of the house and it will just be the two of us. Just Hubs and me. When I finally realized this, it dawned on me that no matter how much money I make, it will never really be enough, but the hours I was working at my previous job was tearing my family to bits. I wasn’t home enough to be a mom and a wife. I had my own mental breakdown and things got messy for awhile for other reasons totally unrelated. I became much stronger than I ever imagined I could be. I realized in the time I had away from work, however, that I needed a job with more flexibility and much better hours. I start that job on Monday. I can’t wait. I’ve never looked forward to starting a new job so much. I still have the trepidation that goes along with starting something new, but I’ll be okay. It’s just the newness of it all. I’ll fit in soon enough and then I’ll be grand. So, this quote of looking at what I have and not what I haven’t got just really struck me. It reminded me of how truly wonderful my life is. I have everything I need and really everything I want. The other things, well, Hubs and I can work on those things. Those are just icing on the cake of life. As long as I have him, I can do anything. He truly is my better half, and yes, he really does complete me.